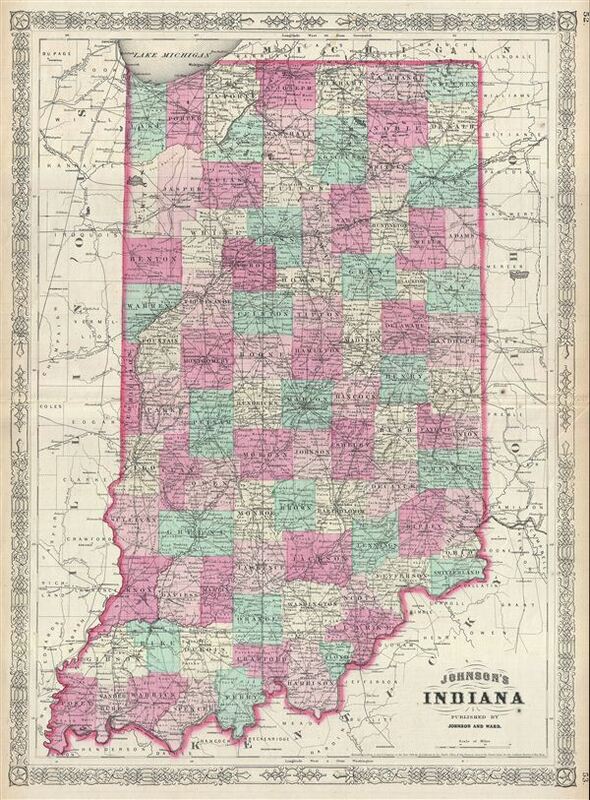 This is Johnson and Ward's 1865 map of Indiana. It covers Indiana in full as well as parts of the adjacent states. Various towns, cities, rivers and several other topographical features are noted with relief shown by hachure. It features the fretwork style border common to Johnson's atlas work from 1863 to 1869. Steel plate engraving prepared by A. J. Johnson for publication as plate nos. 52 and 53 in the 1865 edition of his New Illustrated Atlas. This is the last edition of the Johnson's Atlas to bear the Johnson & Ward imprint. Johnson, A. J., Johnson's New Illustrated Family Atlas, (1865 Johnson and Ward edition). Very good. Text on verso. Minor wear along original centerfold. Minor overall toning. Verso repair along margins. Rumsey 0352.036. Philips (atlases) 843. Not catalogued in Johnson U.S. Map Project.